Gery Swallow was born and raised in Shumen, Bulgaria just inland from the beautiful Black Sea. Known as the cultural crossroads between Europe and Asia, Bulgaria has a rich centuries-long history of winemaking. Homemade wine and Rakia (known as grappa) were crafted from the family vineyard, and may have played a role later when Gery choose to pursue winemaking. While attending her university, an internship opportunity with Chalk Hill Winery in Healdsburg laid the foundation for winemaking in Northern California. 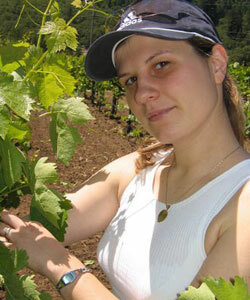 Gery’s education culminated with her Master’s Degree in Technologies of Wine & Spirits from the University of Food Technologies in Plovdiv, Bulgaria. After earning her degree, she moved to Santa Rosa. Gery has a direct understanding in the many facets of the winemaking process, having worked in the vineyards, bottling line, cellar, and lab. Gery is currently part of the established winemaking team at Hanna Winery as their Enologist. Gery Swallow continues to expand her knowledge within the wine industry by regularly attending seminars, trainings and classes. She also has a very strong understanding of language and is fluent in Bulgarian, English, French, Russian, and Spanish.